Street view in Tanjore showing three small pagodas [gopuras]. bl.uk > Online Gallery Home	> Online exhibitions	> Asia, Pacific and Africa Collections	> Street view in Tanjore showing three small pagodas [gopuras]. 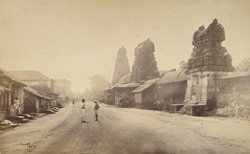 Photograph of a street in Tanjore with three gopurams, taken by Samuel Bourne in the 1860s. Thanjavur was the capital city of the Imperial Chola dynasty who ruled Tamilnad from 850 to 1279; their glory is reflected in the 74 and more temples, which were constructed in the area. The Brihadishvara temple, constructed by Rajaraja I (r.985-1012), is said to be the greatest architectural achievement of the Chola era.